Got a wee bit of Irish in you? Well, even if you don’t, there is no reason that you can’t celebrate St. Patrick’s Day (March 17) with some hearty fare from the Emerald Isle. 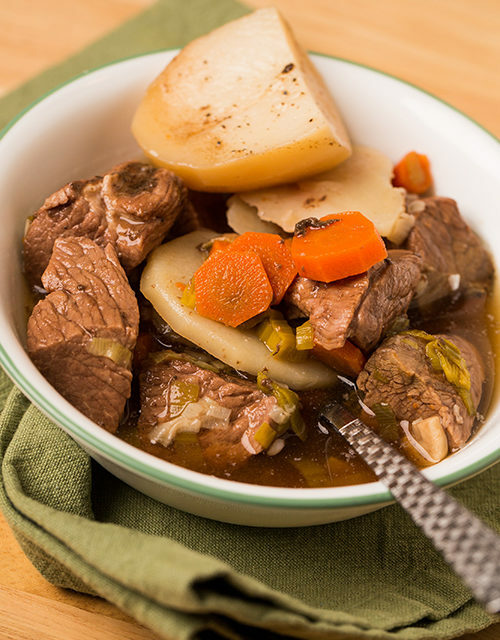 Corned beef and cabbage is often associated with the holiday, but in Ireland, it is Irish lamb stew that is traditional. And what would any proper Irish meal be without a crusty loaf of soda bread and a bowl of colcannon, a dish of potatoes and cabbage? A fitting finale to an Irish meal, a mug or glass of Irish coffee is cause enough to raise a toast in celebration of the feast day. Replace half of the recipe’s beef stock with 1? cups dark stout beer if you desire a heartier flavor. Add lamb pieces on top of leeks, carrots and garlic. Evenly sprinkle 1 teaspoon salt over the top of the lamb pieces and season with black pepper. Place the remaining sliced leeks, carrots and garlic on top of the lamb pieces. Add the beef stock or beef broth and water to the pot. Place remaining pound of whole potatoes on top of the vegetables and lamb pieces. Sprinkle remaining salt over potatoes and season to taste with black pepper. Cover the Dutch oven, place over medium heat and bring the liquid to a boil. Once the liquid comes to a boil, transfer the dish to the oven and let stew cook for about 2 hours. Ladle stew into individual serving bowls. Sprinkle parsley over top of each bowl and serve immediately. Makes 4 to 6 servings. In a large pot of boiling, salted water over medium heat, add potatoes and cook until tender to the point of a sharp knife. Drain potatoes and set aside to cool slightly. Line a plate or a baking sheet with paper towels and set aside. In a small, nonstick skillet over medium heat, cook bacon slices until crisp. Remove bacon slices to paper towels; blot gently with paper towels. Reserve any bacon drippings in skillet. Crumble or chop the bacon into small pieces and set aside. In skillet with reserved bacon drippings, cook onion over medium heat for 2-3 minutes, or until the onion is slightly crisp and tender. Add water; stir to blend browned bits from bottom of pan. Add cabbage, stirring well to combine. Cover skillet, reduce heat to low and cook for about 10 minutes, or until tender and most of the water has evaporated. Transfer cooked cabbage to a plate and set aside. Press potatoes through food mill or ricer. Transfer processed potatoes to a large mixing bowl. Add butter, warm milk and 1 teaspoon salt. Stir in cooked cabbage and bacon. Serve warm. Makes 6 to 8 servings. Preheat oven to 350 degrees F. Line a baking sheet with a piece of parchment paper and set aside. In a large mixing bowl, combine flour, ? cup sugar, baking powder, baking soda and salt. Using a pastry blender, cut the butter into the dry ingredients until the mixture resembles coarse meal. Add buttermilk, raisins or currants, and caraway seeds. Stir just until the dry ingredients are moistened with the buttermilk. Sprinkle flour lightly over a work surface or cutting board. Turn dough out onto floured surface. Knead dough about 10 times with your hands. Shape dough into a round and place it on the prepared baking sheet. Cut a 1/2-inch-deep “X” in the top of the dough and sprinkle the top with the remaining 1 tablespoon sugar. Bake 1 hour, or until lightly golden brown. Cool completely on a wire rack, then cut into 16 wedges. This bread may also be frozen, tightly wrapped, for up to 2 months. Makes 16 servings. Place 2 tablespoons dark-brown sugar at the bottom of 4 mugs or coffee glasses. Add 3/4 cup of coffee and 1/4 cup Irish whiskey to each mug or coffee glass. Top each serving with 1/4 cup whipped cream and a sprinkling of freshly grated nutmeg, if desired. Serve immediately. Makes 4 drinks.